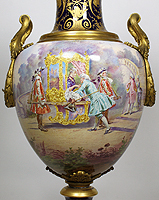 A Very Fine French 19th Century Napoleon III Sévres Style Porcelain and Ormolu Mounted Covered Urn, the 360 degree painted urn centered with an 18th century scene of a young Princess in palanquin with her attendants, the rear with scenes of a chateau and gardens. Signed C. Velly. 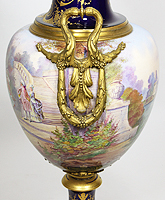 The lid with under-glaze blue interlaced "S" and "D" Sévres mark. Circa: 1870. 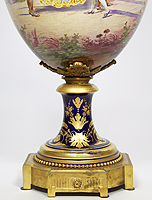 The French National Porcelain Factory of Sèvres (Manufacture Nationale de Sèvres) was and still is one of the most important and renown porcelain manufacturers in Europe. 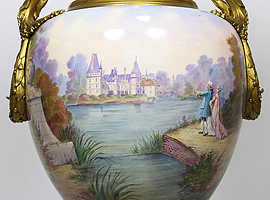 It is located in Sèvres, Hauts-de-Seine, France. 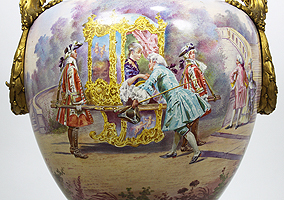 The Sèvres porcelain factory was continuously part of the political order, first royal, then imperial and finally national. Continuously in operation, the factory has been creating objects since 1740.